Of course, with the exception of 'Spinball', and the spin-off game 'Dr Robotnik's Mean Bean Machine', the majority of the Sonic series are platform based games. 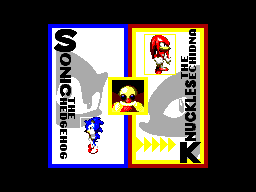 Sonic Blast continues this trend and has added the new character 'Knuckles' to the fold. 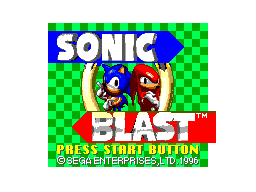 I would like to say from the onset, that the gameplay of Sonic Blast does not quite mirror that of the other games. However, that is not necessarily a bad thing. To explain - with games Sonic 1, 2 and chaos already behind Blast in the series my own personal belief is that another release with that identical model might (only might mind you - no hate mail please!) have been a game too far, and became a little boring. As such, the gameplay in Blast has its similarities to the original games, retaining many of those important concepts - but has added a new style of bonus round, and attempted to update areas such as graphics (which will be detailed in the next section). As it turns out, some of the update attempts were just a stretch too far, and the game does suffer somewhat as a result if comparisons are drawn to the other games in the series - the scrolling is not quite so smooth, and the game is very very easy. BUT, if you have not played Sonic Blast before please try and do what I have done, and block the other Sonic games out of your head because if viewed as an entity of its own, the game can be quite fun! Believe me! One of the major differences and attempted updates in Sonic Blast is that the programmers of the game had tried to give us 3-D character movement and to be quite frank (although retaining my kungfukid roots! ), it doesn't work. It was just a step too far which stopped short of being pulled off. BUT.... and once again, there is a but!.... I DON'T actually think it is the character sprites that have caused the failure in this attempt! I genuinely believe that the feat could have been successful had more attention to detail been present in other graphical areas such as in-game objects and backgrounds. No attempt was made to put any detail into these areas, they have remained bog-standard 2-D, and pretty undetailed and bland at that. The result is that with 3-D sprites and 2-D backgrounds and other graphics, it all looks a bit jumbled and out of context with itself. The fact that the scrolling is a little jerky, as are the sprites when spinning and going round 360 degree loops just adds to the failure. I can see what the programmers were TRYING to do, and it could have worked with just a bit more effort, but unfortunately.... it didn't. Splitting the areas into 'sound effects', and 'music' is definitely necessary here s it is another difficult area to explain to gamers who have played all of the prequels in the Sonic Series. At first, you will undoubtedly when collecting rings go "hey! that's not what the rings in Sonic sound like! ", and you'd be right! The sound effects are simply un-sonic like, and are undoubtedly not as good. Once again though, please don't forget that the sound effects in the original Sonic games are probably close to the best for the system, and not much else bares comparison well. The sound takes a bit of getting used to, but once you actually learn to associate the sounds with the game in your own head - they are actually fine and before long they will seem perfectly normal. 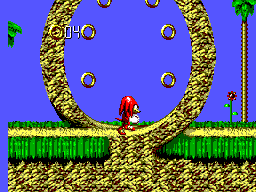 The music on the other hand is reasonably 'Sonic like', and you'll take to it pretty quickly. There isn't too much to say about the controls in Sonic Blast. Mainly because being Sonic in nature, there is nothing overly complicated to do with the characters! That, once again is not a bad thing as it makes gameplay simple and easy to pick up. All that should be said is that the controls are as responsive as they should be, and do not cause any frustration at all. You can do all the sonic stuff you would expect.